4food is all about “de-junking fast food” and their claim to fame is tasty food with nothing artificial with a sustainable touch. Let me just say they make a damn good burger. When I walked into their Midtown East location, the first thing I noticed was the LED menu, since their selection is constantly changing. Customers have the option of building their own burgers, skewers, and meals with a huge variety of ingredients, but I went with one of the pre-selected meals: a Gotham (a salmon burger on a bagel with a scoop of spinach and pinenut, onion, tartar sauce, tomato) with a side of coconut rice and a white peach tea. Most of the meals are $12, and the posted prices include tax (how considerate). 4food prides themselves on being a super social media savvy restaurant and it shows. As I waited for my food to be prepared, I checked in on FourSquare, and my check-in popped up on the LED wall in the back of the restaurant. 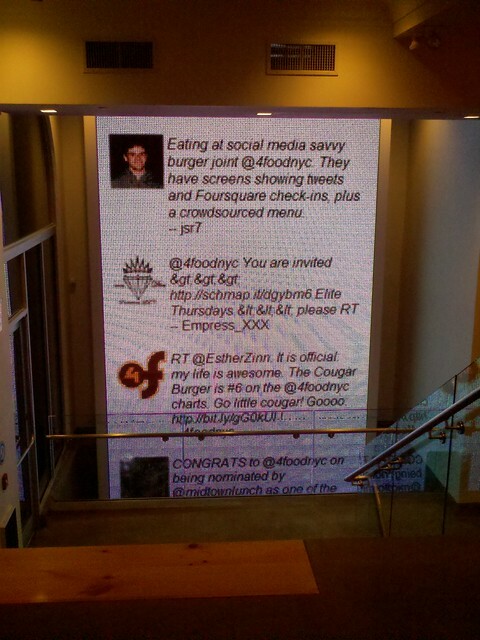 They also stream Tweets about the restaurant (and I had a reply from their Twitter account before I left the premises). One of the tables on the first floor hosts iPads for customer use near the entrance (not so great for cold, windy days, but good exposure for the restaurant, I’m sure) though the wifi fluctuated somewhere between annoyingly spotty and marginally functional. 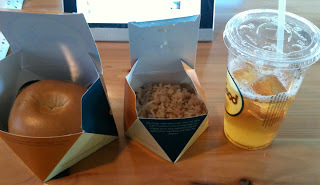 My food arrived in the coolest recycled cardboard polyhedrons (see below) and tasted absolutely divine. The combination of flavors in my burger bordered perfection. Their burger patties feature a hole in the middle where they stuff the veggie scoop, turning the experience into flavor discovery with the second or third bite. The coconut rice unexpectedly delighted me. The tea tasted like heaven - it was very sweet and contained slices of peach (which make a guilt-free dessert). I reluctantly sipped the tea while I was eating the burger because I didn’t want to miss out on either flavor! The restaurant itself has huge dining space and at least 5 one-person bathrooms and the communal seating fits the “counter culture” of the establishment (their pun, not mine). There are separate bins for rubbish and recyclables, and they compost their waste. And the fact that they’ll tweet a response to this within a couple of hours of it's being posted is icing on the (all-natural-and-still-delicious) cake! Bonus: Check out the 4food website for awesome extras like fully-cusotmizable online delivery orders and their rewards program for designing your own burgers! You can even earn 4food cash if your burger become popular. Register your 4food profile and get $5 for your next purchase! It's great!!! Visit Madison Restaurant Review to see a Madison metro area site with detailed reviews and pictures with at least 1 new restaurant review each week.